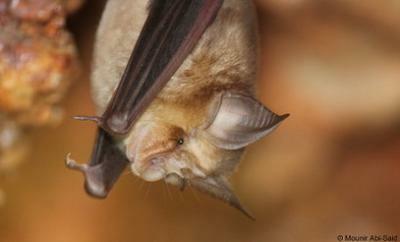 Blasius' Horseshoe bat is a medium-sized bat with a wingspan of 270-310 mm. Its ears, membranes and fluffy fur are light grey and its connecting process is straight and pointed. The species occurs at low altitudes in Mediterranean regions and in limestone areas. It roosts almost exclusively in karst caves, though it can be spotted in other underground sites, such as mines. Its maternity roosts can reach 300 individuals and the species is known to share caves with other species (e.g. R. euryale and M. schreibersii). R. blasius feeds almost exclusively on moths which they hunt while in flight. This is a largely sedentary species with summer and winter roosts usually located in neighbouring caves. This species has a large range in the Palaearctic and the Afrotropics, throughout which it is widely but patchily distributed. In Europe it is thought to be possibly extinct in Slovenia and regionally extinct in Italy. Threats include the loss of Mediterranean woodlands, disturbance and loss of underground habitats and destruction of roost sites.